This AZ Petrified Wood small polished stump stands 3 3/4 inches tall and measures 3 1/8 x 3 inches across. This item ships free anywhere in the continental USA. This AZ Petrified Wood small polished stump weighs over 1.5 Lbs. It stands 3 1/4 inches tall and measures 3 x 3 inches across. This item ships free anywhere in the continental USA. This AZ Petrified Wood small polished stump weighs over 2.5 Lbs. It stands 4 1/4 inches tall and measures 3 1/2 x 2 3/8 inches across. This item ships free anywhere in the continental USA. This Stunning AZ Petrified Wood small polished stump weighs over 7 Lbs. It stands 6 inches tall and measures 4 1/4 x 4 1/4 inches across. This item ships free anywhere in the continental USA. This AZ Petrified Wood small polished stump weighs over 6.5 Lbs. It stands 4 1/2 inches tall and measures 5 x 3 3/4 inches across. This item ships free anywhere in the continental USA. This AZ Petrified Wood small polished stump weighs over 6 Lbs. It stands 2 3/4 inches tall and measures 7 1/2 x 4 3/4 inches across. This item ships free anywhere in the continental USA. This AZ Petrified Wood small polished stump weighs over 3.5 Lbs. It stands 2 3/4 inches tall and measures 4 3/4 x 4 inches across. It has a few minor facial flaws. This item ships free anywhere in the continental USA. This AZ Petrified Wood small polished stump weighs over 4.5 Lbs. It stands 7 1/2 inches tall and measures 3 3/4 x 2 1/4 inches across. This item ships free anywhere in the continental USA. This AZ Petrified Wood small polished stump weighs over 2 Lbs. It stands 4 1/4 inches tall and measures 3 1/4 x 2 1/2 inches across. This item ships free anywhere in the continental USA. This AZ Petrified Wood small polished stump weighs over 1.5 Lbs. It stands 3 inches tall and measures 3 x 2 inches across. This item ships free anywhere in the continental USA. This AZ Petrified Wood small polished stump weighs over 9.5 Lbs. It stands 5 inches tall and measures 5 1/2 x 5 1/4 inches across. This item ships free anywhere in the continental USA. This AZ Petrified Wood small polished stump weighs over 2.5 Lbs. It stands 2 1/8 inches tall and measures 5 1/2 x 5 1/4 inches across. This item ships free anywhere in the continental USA. This AZ Petrified Wood small polished stump weighs over 6 Lbs. It stands 4 1/2 inches tall and measures 5 1/2 x 4 3/4 inches across. This item ships free anywhere in the continental USA. This AZ Petrified Wood small polished stump weighs over 15 Lbs. It stands 5 1/2 inches tall and measures 7 x 5 3/4 inches across. This item ships free anywhere in the continental USA. This AZ Petrified Wood small polished stump weighs over .5 Lbs. It stands 1 7/8 inches tall and measures 3 x 2 inches across. This item ships free anywhere in the continental USA. This AZ Petrified Wood small polished stump weighs over 16 Lbs. It stands 3 1/4 inches tall and measures 9 3/8 x 7 inches across. This item ships free anywhere in the continental USA. This AZ Petrified Wood small polished stump weighs over 2 Lbs. It stands 1 3/4 inches tall and measures 4 x 3 1/2 inches across. This item ships free anywhere in the continental USA. This AZ Petrified Wood small polished stump weighs over 5.5 Lbs. It stands 5 3/8 inches tall and measures 5 1/4 x 4 inches across. This item ships free anywhere in the continental USA. This AZ Petrified Wood small polished stump weighs over 13.5 Lbs. It stands 4 1/4 inches tall and measures 8 x 6 1/2 inches across. This item ships free anywhere in the continental USA. This AZ Petrified Wood small polished stump weighs over 6 Lbs. It stands 5 1/4 inches tall and measures 5 x 4 inches across. This item ships free anywhere in the continental USA. This AZ Petrified Wood small polished stump weighs over 2 Lbs. It stands 3 1/2 inches tall and measures 3 1/8 x 3 inches across. This item ships free anywhere in the continental USA. This AZ Petrified Wood small polished stump weighs over 21 Lbs. It stands 5 inches tall and measures 8 1/2 x 7 3/4 inches across. This item ships free anywhere in the continental USA. This AZ Petrified Wood small polished stump weighs over 12 Lbs. It stands 3 1/2 inches tall and measures 8 1/4 x 5 1/2 inches across. This item ships free anywhere in the continental USA. This AZ Petrified Wood small polished stump weighs over 16 Lbs. It stands 5 1/8 inches tall and measures 7 1/2 x 6 1/4 inches across. This item ships free anywhere in the continental USA. This AZ Petrified Wood small polished stump weighs over 12 Lbs. It stands 5 1/2 inches tall and measures 6 1/2 x 4 3/8 inches across. This item ships free anywhere in the continental USA. This AZ Petrified Wood small polished stump weighs over 7 Lbs. It stands 7 inches tall and measures 5 x 3 3/4 inches across. This item ships free anywhere in the continental USA. This AZ Petrified Wood small polished stump weighs over 10 Lbs. It stands 7 1/2 inches tall and measures 5 3/8 x 3 3/4 inches across. This item ships free anywhere in the continental USA. This AZ Petrified Wood small stump weighs over .5 Lbs. It is 1 7/8 inches tall. It measures 2 1/2 x 1 3/4 inches across. This item ships free anywhere in the continental USA. This AZ Petrified Wood small polished stump weighs over 8.5 Lbs. It stands 4 inches tall and measures 8 x 5 inches across. This item ships free anywhere in the continental USA. This AZ Petrified Wood small stump weighs over .5 Lbs. It is 1 3/4 inches tall. It measures 3 3/8 X 2 7/8 inches across. This item ships free anywhere in the continental USA. This AZ Petrified Wood small stump weighs 11.5 Lbs. It is 9 inches tall. It measures 4 3/4 x 4 inches across. This item ships free anywhere in the continental USA. This AZ Petrified Wood small stump weighs over .5 Lbs. It is 2 1/4 inches tall. It measures 2 3/8 x 2 1/8 inches across. Both sides have been polished. This item ships free anywhere in the continental USA. This AZ Petrified Wood small stump weighs .5 Lbs. It is 1 inch tall. It measures 2 1/2 x 2 1/8 inches across. This item ships free anywhere in the continental USA. This AZ Petrified Wood small stump weighs over 5.5 Lbs. It is 4 1/4 inches tall. It measures 5 1/2 x 4 1/2 inches across. This item ships free anywhere in the continental USA. This AZ Petrified Wood small polished stump weighs over 9.5 Lbs. It stands 4 3/4 inches tall and measures 6 x 5 3/8 inches across. This item ships free anywhere in the continental USA. This AZ Petrified Wood small polished stump weighs over 6.5 Lbs. It stands 4 1/8 inches tall and measures 5 1/2 x 4 1/4 inches across. This item ships free anywhere in the continental USA. This AZ Petrified Wood small stump weighs over 2 Lbs. It is 2 1/2 inches tall. It measures 4 x 3 1/4 inches across. This item ships free anywhere in the continental USA. This AZ Petrified Wood small stump weighs 2.5 Lbs. It is 2 inches tall. It measures 4 3/4 x 4 inches across. This item ships free anywhere in the continental USA. This AZ Petrified Wood small stump weighs over 3 Lbs. It is 2 5/8 inches tall. It measures 4 1/2 x 4 1/2 inches across. This item ships free anywhere in the continental USA. This AZ Petrified Wood small stump weighs over 2 Lbs. It is 3 1/2 inches tall. It measures 3 1/8 x 3 inches across. This item ships free anywhere in the continental USA. This AZ Petrified Wood small stump weighs over 1.5 Lbs. It is 5 inches tall. It measures 3 x 2 inches across. This item ships free anywhere in the continental USA. This AZ Petrified Wood small polished stump weighs over 5.5 Lbs. It stands 4 inches tall and measures 6 x 5 3/8 inches across. This item ships free anywhere in the continental USA. This AZ Petrified Wood small stump weighs 1.5 Lbs. It is 2 1/4 inches tall. It measures 3 7/8 x 2 3/4 inches across. This item ships free anywhere in the continental USA. This AZ Petrified Wood small stump stands 1 3/8 inches tall. It measures 2 3/4 x 1 3/8 inches across. This item ships free anywhere in the continental USA. This AZ Petrified Wood small polished stump weighs over 19 Lbs. It stands 8 inches tall and measures 6 1/2 x 4 1/2 inches across. This item ships free anywhere in the continental USA. This AZ Petrified Wood small stump weighs over 2.5 Lbs. It is 2 inches tall. It measures 4 5/8 x 4 3/4 inches across. This item ships free anywhere in the continental USA. This AZ Petrified Wood small stump weighs 4 Lbs. It is 4 1/8 inches tall. It measures 3 5/8 x 3 1/4 inches across. This item ships free anywhere in the continental USA. This AZ Petrified Wood small stump weighs over 1 Lbs. It is 2 1/4 inches tall. It measures 3 1/4 x 2 1/2 inches across. This item ships free anywhere in the continental USA. This AZ Petrified Wood small stump weighs over .5 Lbs. It is 2 7/8 inches tall. It measures 2 1/4 x 1 3/8 inches across. This item ships free anywhere in the continental USA. This AZ Petrified Wood small stump weighs over 13.5 Lbs. It is 6 inches tall. It measures 6 3/4 x 6 1/2 inches across. This item ships free anywhere in the continental USA. This AZ Petrified Wood small stump weighs 1 Lbs. It is 3 1/2 inches tall. It measures 1 3/4 x 1 3/4 inches across. This item ships free anywhere in the continental USA. This AZ Petrified Wood small stump weighs over 1 Lbs. It is 2 5/8 inches tall. It measures 3 x 2 3/8 inches across. This item ships free anywhere in the continental USA. This AZ Petrified Wood small stump weighs over 6 Lbs. It is 4 inches tall. It measures 5 3/8 x 4 inches across. This item ships free anywhere in the continental USA. This AZ Petrified Wood small stump weighs over 2 Lbs. It is 3 1/8 inches tall. It measures 4 1/8 x 2 5/8 inches across. This item ships free anywhere in the continental USA. This AZ Petrified Wood small stump weighs 1.5 Lbs. It is 3 1/8 inches tall. It measures 3 x 2 inches across. This item ships free anywhere in the continental USA. This AZ Petrified Wood small stump weighs over 3 Lbs. It is 2 1/8 inches tall. It measures 4 7/8 x 4 1/2 inches across. This item ships free anywhere in the continental USA. This is avery unique AZ Petrified Wood polished knot. It weighs over 23.5 Lbs. It stands 12 inches tall and measures 8 x 3 1/4 inches across. This item ships free anywhere in the continental USA. This AZ Petrified Wood small polished stump weighs over 13.5 Lbs. It stands 3 3/4 inches at the thickest point. It measures 8 x 7 /8 inches across. This item ships free anywhere in the continental USA. This AZ Petrified Wood small polished stump weighs over 6.5 Lbs. It stands 2 1/4 inches tall and measures 7 1/4 x 6 1/4 inches across. This item ships free anywhere in the continental USA. This AZ Petrified Wood small polished stump weighs over 10 Lbs. It stands 4 inches tall and measures 7 1/2 x 5 inches across. This item ships free anywhere in the continental USA. This AZ Petrified Wood small polished stump weighs over 21.5 Lbs. It stands 8 inches tall and measures 8 x 5 1/4 inches across. This item ships free anywhere in the continental USA. This AZ Petrified Wood small polished stump weighs over 28.5 Lbs. It stands 9 1/2 inches tall long and measures 8 1/4 x 9 inches across. This item ships free anywhere in the continental USA. This AZ Petrified Wood small polished stump weighs over 21.5 Lbs. It stands 7 1/4 inches tall and measures 6 1/2 x 12 inches across. This item ships free anywhere in the continental USA. This AZ Petrified Wood small polished stump weighs over 8.5 Lbs. It stands 3 3/4 inches tall and measures 7 x 5 inches across. This item ships free anywhere in the continental USA. This AZ Petrified Wood small polished stump weighs over 5 Lbs. It stands 4 1/2 inches tall and measures 3 3/8 x 4 1/2 inches across. This item ships free anywhere in the continental USA. This AZ Petrified Wood small polished stump weighs over 8.5 Lbs. It stands 3 1/2 inches tall and measures 7 1/4 x 5 3/4 inches across. This item ships free anywhere in the continental USA. This AZ Petrified Wood small polished stump weighs over 7 Lbs. It stands 4 5/8 inches tall and measures 5 3/4 x 4 3/4 inches across. This item ships free anywhere in the continental USA. This AZ Petrified Wood small polished stump weighs just under 7 Lbs. It stands 3 inches tall and measures 6 1/2 x 6 1/2 inches across. This item ships free anywhere in the continental USA. This AZ Petrified Wood small polished stump weighs over 8.5 Lbs. It stands 3 1/2 inches tall and measures 6 7/8 x 4 1/2 inches across. This item ships free anywhere in the continental USA. This AZ Petrified Wood small polished stump weighs over 8 Lbs. It stands 4 1/2 inches tall and measures 7 x 6 3/4 inches across. It has been discounted due to a flaw. This item ships free anywhere in the continental USA. This AZ Petrified Wood small polished stump weighs over 20.5 Lbs. It stands 6 inches tall and measures 7 x 6 inches across. This item ships free anywhere in the continental USA. This Small Polished stump weighs over 28 Lbs. It stands 5 inches tall. It measures 8 1/2 x 10 1/4 inches. This item ships free anywhere in the continental USA. This AZ Petrified Wood small stump weighs over 32 Lbs. It stands 6 1/4 inches. It measures 8 1/4 x 7 1/4 inches across. This item ships free anywhere in the continental USA. This AZ Petrified Wood small polished stump weighs over 10.5 lbs. It stands 8 inches tall at the tallest point. It measures 5 1/2 x 4 3/4 inches across. This item ships free anywhere in the continental USA. This AZ Petrified Wood small polished stump stands 4 1/2 inches tall and measures 7 3/8 x 10 inches. This item ships free anywhere in the continental USA. This AZ Petrified Wood small polished stump measures 7 5/8 x 5 x 5 1/4 inches. This item ships free anywhere in the continental USA. This small polished stump of AZ Petrified Wood weighs over 3 Lbs. It measures 5 1/8 x 4 5/8 x 2 3/4 inches at the widest point. This piece does have some bark missing on one side. This item ships free anywhere in the continental USA. This AZ Petrified Wood small polished stump weighs over 1 Lbs. It measures 3 5/8 x 3 5/8 x 1 3/4 inches. This item ships free anywhere in the continental USA. This AZ Petrified Wood small polished stump weighs over 1.5 Lbs. It measures 6 1/4 x 3 x 1 3/4 inches. This item ships free anywhere in the continental USA. 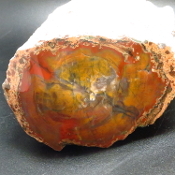 This small polished stump of AZ Petrified Wood measures 3 1/4 x 3 1/4 x 2 1/2 inches. This item ships free anywhere in the continental USA. 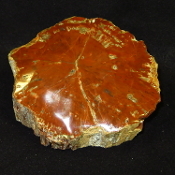 This small polished stump of AZ Petrified Wood measures 4 1/2 x 4 x 4 1/4 inches. This item ships free anywhere in the continental USA. 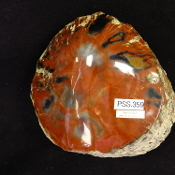 This small polished AZ Petrified Wood branch measures 3 inches tall. The face is 2 1/2 x 2 1/4 inches across. It weighs over 1 lbs. This item ships free anywhere in the continental USA. This small polished AZ Petrified Wood stump is 4 3/4 inches tall. The face is 4 x 3 1/2 inches across. It weighs over 3.5 Lbs. This item ships free anywhere in the continental USA. This small AZ Petrified Wood polished stump measures 5 3/4 x 3 3/4 inches across the face. It stands 3 1/2 inches tall. This item ships free anywhere in the continental USA. This AZ rainbow Petrified Wood polished stump measures 7 x 7 x 3 inches. It weighs over 8 Lbs. It has a small chip on the lower center of the face. Stand not included. This item ships free anywhere in the continental USA. 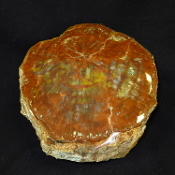 This AZ Petrified Wood polished Woodworthia Stump measures 7 x 6 x 4 inches. It weighs over 9 Lbs. Stand not included. This item ships free anywhere in the continental USA. This AZ rainbow Petrified Wood polished stump measures 7 1/2 x 5 x 1 1/2 inches. It weighs over 4 Lbs. Stand not included. This item ships free anywhere in the continental USA.